Guide To Cumbre del Sol, Costa Blanca, Spain. Cumbre del Sol is the largest and most well known urbanization of Benitachell on the northern Costa Blanca in Spain. Cumbre del Sol is in easy access of two international airports Valencia and Alicante. It is also not far away from the N332 and AP7 motorways. You can see it’s positioning and location on this map of Cumbre del Sol. Once at the airport you have a range of different airport transfer options to Cumbre del Sol including private shuttle buses, taxis or car hire. Cumbre del Sol is also home to the private English primary school namely Lady Elizabeth. Cumbre del Sol also has a supermarket, bank, pharmacy and restaurant. The nearest good hairdresser is Heaven, also doing nail and spa treatments at reasonable prices. Cumbre del Sol is quite separate from the town of Benitachell and is accessed by a steep road to a very high elevation reuslting in spectacular views, what this does mean is that if you are staying in Cumbre del Sol car hire is essential. If you are planning a holiday to Cumbre del Sol there are many villas for rent. The nearest beach is Moraig beach and the next nearest beach would be Moraira’s main beach. Javea’s Arenal with its promenade of bars, restaurants and boutiques is also a popular choice for a day out at the beach. With its easy access to the motorway and N332 Cumbre del Sol is also only a half hour away by car from Benidorm with its theme parks and nightlife. Aqualandia, Terra Mitica, Terra Natura and Aqua Natura and Mundomar are all fun days out for the whole family, with their theme parks, and rides, and water slides, while at the Benidorm Palace you can enjoy dinner and a show. Boat hire, wind-surfing, fishing and scuba diving are available in Moraira. Karting is fifteen minutes away while horse riding is available at the local hipica or stables. Tennis courts are also available for the more energetic. There are numerous commercial centres with shops and restaurants in Moraira and Benitachell, while the big shopping centre of La Portal La Marina in Ondara has everything under one roof. C&A, Mango, Zara, Druni, Casa, Alehop, Eroski and so much more. At the bottom of Cumbre Del Sol on the Moraira side you will find a Mercadona for all your grocery shopping. On the Benitachell side you will find a Mas y Mas supermarket. Cumbre Del Sol enjoys a Mediterranean climate with hot summers and mild winters. Many ex-pats have made Cumbre del Sol their new home and it is easy to see why as it is very central to quite a few villages and seaside resorts, near to the action but not too busy. For more weather information including today’s weather in Cumbre del Sol see our Benitachell weather page. Perched high up Cumbre del Sol has spectacular views of the Mediterranean Sea, Calpe, Moraira, Javea and Denia. See for yourself – below is a video showing the mirador at Cumbre del Sol. This lookout spot has amazing views. If you have found this guide on Cumbre del Sol because you are thinking moving to the Cumbre del Sol area you may also find our moving to Spain section with expat interviews and accounts of how they found their move to Cumbre del Sol Spain, useful and informative. Sleeps 5/6 adults. 95 square metres. Spacious 2 bedroom apartment with relaxing views to Sierra de Bernia. Very well equipped kitchen and minimalist furnishings, all brand new. Easy access from the street and 2 minutes walk from lovely pools and gardens. 10 minutes drive from Blue Flag beach. Diving and golf. Apartment in Montecala, overlooking Sierra de Bernia and Moraira from its lovely balcony. Sea views at the end of the street. Simply but tastefully furnished and equipped with everything to make your stay comfortable and minimal maintenance. Walk to the 2 fantastic pools( with children’s area) or drive to beautiful Cala Moraig in less than 10 minutes. Moraira and Javea at only 5km away and many other places to explore in the beautiful Marina Alta area. Diving and golf facilities in Benitaxell (9) and Jávea (18). Ideal base for hiking in spring and autumn but if you do not mind the heat also in the summer. You will need a car since the landscape in this part of the Cumbre is dramatically steep. Parking space. Cumbre del Sol has shops, chemist and restaurants open all year round as well as bank, horse riding facilities and post boxes. Main bedroom with brand new double bed and 2 night tables. Shelving unit for clothes and shoes. Second bedroom has 2 single beds and chest of drawers for clothes. Next to this bedroom there is a walking cupboard with bar for hanging clothes and shelves. Spacious bathroom with pressure shower, wash basin and wc. Storage unit. Automatic washing machine. Ironing board and iron. Folding clothes hanger. Bucket and mop. 2 floor brushes, dustpan. Laundry basket. Small sun umbrella for the beach. Balcony. Set of white melamine table with adaptable large sun umbrella and 4 chairs. There are 2 good size fans to be used in the summer but I find that it is possible to create a draft and keep windows open. It is safe since windows have roller blinds and wrought iron bars. For the cooler months there is a blow heater that is all you need to bite the chill. The apartment is very uncluttered and has the minimum necessary to make the most of the space bur still making it cosy. A foldable cot can be available on request. It would be safe for children and elderly people since there are only six steps to negociate from the street. There are six steps from street to doorstep so people with limited mobility could manage but there is not a ramp for wheelchairs. Montecala is now looking greener and there are trees, flowers and bushes growing in all the streets. The 2 pools are just 2 minutes walk from the apartment and are beautiful. See the photos!. Changing rooms and toilets. Outdoor shower cabins. Their size requires a life guard. There are sundeck chairs in the pool area accessible only to residents of Montecala. There is also a bar selling drinks and light meals. The Centro Comercial “Los Lirios” offers nearby restaurants but you can also visit the main social area with more shops and services at only 10 minutes drive just after the beach. This a fantastic place if you want to relax and take it easy. You must love the sun and the “dolce far niente” as the Italian say. Once you stock your fridge with some nice food from the local markets or supermarkets you can decide if you spend the day in the beach, go diving or the pool and then drive down to Moraira for fresh fish and ice-cream. You can play golf or explore the many little villages around, visit weekly food and clothes markets (with fantastic bargains!). You can relax and watch a wonderful sunset. Montecala is still very new and fresh and there is a feeling of space around despite the large scale of the urbanization. In the cooler months there are many mountain paths you can take to reach spectacular views in the surroundings of Serrania de Bernia. This is an area of outstanding beauty and a traditional holiday spot for Spaniards. Cala Moraig is a small sand and pebble beach. Blue Flag emerald green clear water. It is 10 minutes drive from the apartment but you need a car since it is very steep to get down. Favourite spot for divers who enter the cave at one of its sides. Sundecks, umbrellas and pedalos for hire. 2 small bars offering affordable and home made meals and paellas. Moraira and Jávea are at 15 minutes drive. Denia 30 minutes drive. This stretch of coast has small hidden coves to explore. Valencia is 110 Km from Benitaxell. Motorway “Autopista del Mediterráneo” 8 euros one way. Exit 63. You may take the A road instead. Alicante is a bit closer. 80 Km. Motorway or A road. The theme park “Terra Mítica” is worth a visit on your way to Benitaxell. Use of car is essential due to the steep and dramatic cliffs around Montecala. Teulada, Benissa and Moraira are small villages at less than 30 minutes drive. Benissa and Teulada have a lovely old part and a weekly market worth exploring. Festivities take place in August with “verbenas” or street parties with music and dancing. Moraira has a lovely fishing harbour with plenty of good restaurants. Jávea, 8km. Its promenade is a riot of colours and fragrant aromas from freshly cooked local food in the evenings. The best and cheaper fish place is at the end. Although Montecala is an oasis of calm you do not have to go very far if you want more action. There is an excellent restaurant in the Cumbre only 15 minutes drive from the apartment and a very well stocked supermarket with plenty of English brands. But if you want to be more adventurous this is the land of rice and fish. Benissa, Gata de Gorgos, famous for its wicker works and baskets, all villages have their speciality, sweet or savory. Check the local “Hornos” (Bakery) for delicious cakes and pastries. Weekly markets, history in Denia, Calpe and its massive rock. This part of the Costa Blanca is called “Marina Alta” and is blessed with a fabulous coast line, full of small coves and beaches. The light house of Cape La Nao is worth a visit following the maritime road that takes either from Benitaxell or Jávea. You can find abundant information about seasonal activities when you arrive if you visit the local shops since they all stock the weekly bulletins with what’s on. The beauty of Cumbre del Sol is that because there is people living there all year round the services in the area are reliable. There is plenty of peace and quiet but if you wish to be more social you can find plenty of opportunities to do so if you get in your car and go. 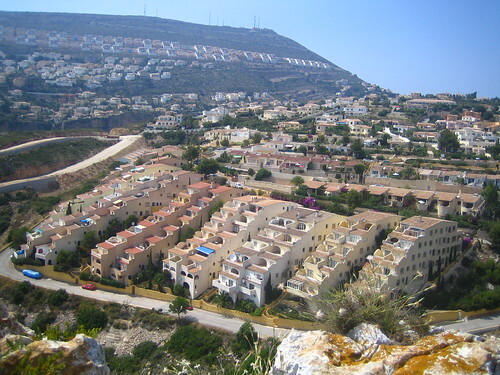 Page Summary – This page contains unique content about the urbanization of Cumbre del Sol in Benitachell on the Northern Costa Blanca. Please help us to make this the number one tourist resource for Cumbre del Sol by adding any comments, reviews, ratings and feedback on any aspect of Cumbre del Sol that you know about. We also welcome your photos, pictures and videos of Cumbre del Sol for posting on our website.